Posted by OromianEconomist in Catalonia, Kurdistan, Kurds, Self determination. The Kurds are on the verge of The World’s Next Country getting a homeland of their own. If they do, the Middle East will never be the same. (EBIL, Iraq) — As you walk around the streets of this city of 500,000, you could be forgiven for thinking you’re in the capital of a small but up-and-coming Middle Eastern country. Police officers and soldiers sport the national flag on their uniforms — the same flag that flies proudly on public buildings, and, in a giant version, from a towering pole in the center of town. There’s a national anthem, which you might hear on the national evening TV news, broadcast solely in the local language. You’ll also notice imposing buildings for parliament and the prime minister, as well as thediplomatic missions of a number of foreign states, some of them offering visas. Yet appearances deceive: This is not an independent state. Yet appearances deceive: This is not an independent state. You’re in Iraq — more precisely, the part of northern Iraq known officially as the Kurdistan Regional Government (KRG). You’ll be reminded of this fact when you open your wallet to pay for something: the local currency is still the Iraqi dinar (though the U.S. dollar circulates widely). Nor do any of the foreign governments that maintain consulates in Erbil recognize Kurdish statehood; nor, for that matter, does the government of the KRG itself. For the time being, Iraqi Kurdistan is still under Baghdad’s writ. Emphasis on “for the time being.” In July of last year, KRG President Massoud Barzani asked his parliament to start preparing for a referendum on independence. It was a suitably dramatic response to the stunning disintegration of the Iraqi state under then-Prime Minister Nouri al-Maliki. Earlier, in January 2014, Maliki’s government had cut off financial transfers to the Kurds as part of a fight over control of oil resources, enraging Erbil even as his repressive policies toward Iraq’s Sunni Arabs were fueling the dramatic rise of the Islamic State (IS). Last summer, after IS forces shocked the world by seizing control of Mosul, Iraq’s second-largest city, the jihadists pushed from there deep into Kurdish territory, at one point getting within 25 miles of Erbil. Buoyed by U.S.-led airstrikes on IS positions, the Kurdish army, the Peshmerga, soon rallied, forcing the Islamic State to retreat. But the Kurds didn’t stop there. The collapse of the demoralized Iraqi Army in large swathes of northern Iraq had created a vacuum that Kurdish troops were only too happy to fill. Almost by accident, KRG leaders abruptly found themselves ruling 40 percent more territory than at the start of the conflict. This expansionbrought a particularly important prize: Kirkuk, the city long hailed by Iraqi Kurdish nationalists as “our Jerusalem,” the spiritual and political focus of a future state. This expansion brought a particularly important prize: Kirkuk, the city long hailed by Iraqi Kurdish nationalists as “our Jerusalem,” the spiritual and political focus of a future state. It also helps that Kirkuk sits at the center of one of Iraq’s biggest oil fields, and that gives the Kurds a lucrative source of income that could help to sustain the economy of a new country. Iraq’s Kurds, Arabs, and Turkmen have long squabbledover control of the city; in the 1980s, Saddam Hussein poured huge resources into an “Arabization” campaign that used forced population transfers to undermine Kurdish influence there. In June 2014, by contrast, the government in Baghdad could only look on helplessly as Peshmerga forces supplanted fleeing Iraqi troops and took over the city. The 30 million Kurds of the Middle East don’t only live in Iraq, of course. But all of them are feeling the tremors of change. Iran, which has a significant Kurdish minority of its own, is strengthening its ties with the KRG, which it views as a vital ally in the fight against IS. In Syria, the civil war has enabled Kurds to set up wide-ranging self-administration in the northeast of the country — thus eroding the border between Syrian and Iraqi Kurds, who now travel back and forth across the line without visas. And in Turkey, home to the region’s largest Kurdish minority, the government of President Recep Tayyip Erdogan has abandoned long-held policies aimed at the suppression of a distinct Kurdish identity and is conducting peace talks with the Kurdish Workers’ Party (PKK), responsible for a decade-long insurgency in eastern Turkey. If the dream finally becomes a reality, there is one nation in particular that the Kurds will have to thank for it: the United States. Even though U.S. policy toward the Kurds has often been subordinated to the same spirit of realpolitik that defines so many of Washington’s policies in the region, today’s Iraqi Kurdistan traces its origins to two key events: the establishment of a no-fly zone over the region after the Allied victory over Saddam in 1991, and the overthrow of the Iraqi dictator in the U.S.-led invasion in 2003. As a result, Kurds tend to be overwhelmingly pro-American — to an extent that comes as quite a jolt to anyone who’s spent time in other parts of the Middle East. And yet President Obama and his predecessors in the White House have all been notably reluctant to give their blessing to Kurdish statehood — out of the not entirely unreasonable fear that creating a new player in such a volatile neighborhood could invite serious instability. To name but one possible risk: a declaration of secession by Iraqi Kurdistan could prompt the final collapse of rump Iraq into separate Sunni and Shiite statelets, intensifying sectarian conflict throughout the region. This climate of uncertainty helps to explain why Kurdish leaders respond to questions about their timetable for statehood with perceptible caution. “The path is full of obstacles,” says Fuad Hussein, President Barzani’s chief of staff. Iraqi Kurds, he says, are still a long way from standing on their own feet economically. Kirkuk may give them a promising source of petroleum, but since they have no access to the sea, they’re dependent on the goodwill of Baghdad or their neighbors to ship their oil to world markets. And even if matters have improved in recent years, Hussein notes, that goodwill is far from given. Over the past century all the governments that harbor big Kurdish minorities have embarked on brutal efforts to tamp down any hint of Kurdish self-determination — and Kurds haven’t forgotten. More urgently, Iraqi Kurds still face a major existential threat from the new Islamic State stretching along a 600-mile border to the south. Andcollapsing oil prices certainly don’t help. “We want to give Iraq a chance to be a democratic state,” Hussein assured me. “We want to give Iraq a chance to be a democratic state,” Hussein assured me. He didn’t have to add that the Kurds have been waiting for just such an outcome for more than a decade now, and that they can’t be expected to wait forever. But they’ll still need to proceed carefully. Given the vulnerabilities of their position, the Kurds can’t afford to be seen as the ones responsible for the final demise of Iraq. If Iraqi Kurdistan really does decide to grab the ring of independence, it will need to make sure that Baghdad, its own neighbors, and, perhaps, most importantly, the United States, are all more or less reconciled with the move. Hussein compares the birth of a Kurdish state to a newborn baby: “We don’t want to have a child that has many illnesses, and that will pass away after a few months. A child must have a good environment, and parents that will take care of it.” If Kurdistan is to be born, he says, “it must be a part of stability in this area.” Of course, even the healthiest babies have sometimes been known to give fits to the neighbors. The Kurds may yet pull it off. But don’t bet on it anytime soon. Posted by OromianEconomist in Catalonia, Self determination. About 1.6 million people in Spain’s northeastern region of Catalonia have voted in favor of breaking away from the country and carving out a new nation in a symbolic independence poll, according to partial official results. More than five million were eligible to vote, meaning many did not bother to participate amid worries about the vote’s lack of legal guarantees and its non-binding status. Catalan lawmakers opted for the watered-down poll after plans to hold an official referendum on independence were suspended by Spain’s Constitutional Court amid the central government’s challenge that the referendum was unconstitutional. The court then suspended the mock vote on the same grounds. 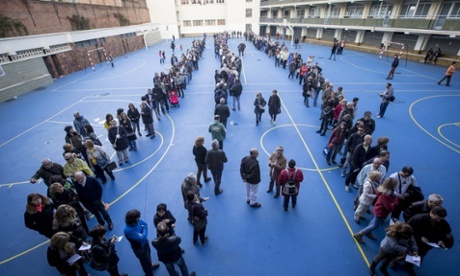 “Despite the enormous impediments, we have been able to get out the ballot boxes and vote,” Catalan president Artur Mas said after casting his ballot at a school in Barcelona. Polls in recent years say the majority of Catalonia’s 7.5 million inhabitants want an official vote on independence, while around half support cutting centuries-old ties with Spain. It came two months after the Scots voted to remain in the United Kingdom. Sunday’s symbolic vote was the latest massive pro-independence demonstration in the wealthy region fiercely proud of its own traditions and language. As Catalonia or else where the Oromians make the historical, territorial,social and economic cases for their national independence. Oromia is located mainly within Ethiopia and covers an area of about 232,000 square miles (600,000 square kilometers). The 3.5 million-year-old fossilized human skeleton known as “Lucy” (or “Chaltu” in Oromo) was found by archaeologists in Oromia. Present-day Oromos also live in Kenya and Somalia. In the late nineteenth century, Oromos were colonized and mainly by Abyssinian Ethiopia. They lost their independent institutional and cultural development. Oromia has been considered the richest region of the Horn of Africa because of its agricultural and natural resources. It is considered by many to be the “breadbasket” of the Horn of Africa. Farm products, including barley, wheat, sorghum, xafi (a grain), maize, coffee, oil seeds, chat (a stimulant leaf), oranges, and cattle are raised in abundance in Oromia. Oromia is also rich in gold, silver, platinum, marble, uranium, nickel, natural gas, and other mineral resources. It has several large and small rivers used for agriculture and for producing hydroelectric power. Since colonization the Oromian economy has been structured towards serving the interests of the highly exploitative and economically poor Abyssinian colonizers. Oromo’s human rights and civil rights have been violated by one Ethiopian government after another. Oromos do not have control over their lives, lands, other properties, or country. They do not have a voice in the government, and they are not allowed to support independent Oromo political organizations. Oromos have been threatened, murdered, or imprisoned for voicing against economic exploitation and social marginalization. Oromos are not treated according to the rule of law. Today thousands of Oromos are kept in secret concentration camps and jails or being killed just for being Oromo. Their bodies are thrown into the streets to terrorize the rests of Oromo people and to prevent them from supporting the Oromo national movement. Human rights organizations such as Africa Watch, the Oromia Support Group, and Amnesty International have produced evidences upon evidences on human rights violations against the Oromians. 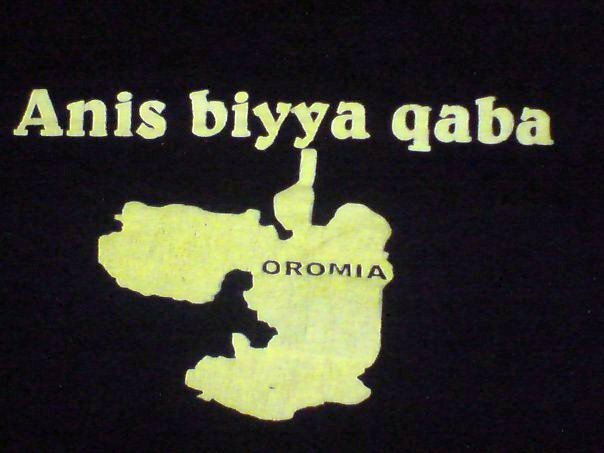 The Oromians are voicing: Oromia shall be free! (Oromiyaan ni bilisoomti!). That is the demand for national economic, political and social independence.